26 out of 29 (89.7%) reviewers said they would recommend this vehicle to a friend. It is really no surprise, seeing the sheer number of them on the road. Swoopy styling and yet practical interior with one of the best class A engines and huge boot. Not many come close. The pi version has a more powerful engine and with Honda build quality, warranty isn't really an issue. Offers more plush ride as compared with fit/jass despite similar chassis foundations. Other than transmission whine and delay, all else is as much as one can get from practical motoring with some pizzazz in Sg. Frugality - A little over half tank to KL. Ride can be crashy of broken surfaces. Transmission slow to react but at times lungy.. esp in first gear. Power wise i would recommend you go tune the car after your warranty over. Tuning cannot be checked. So its safe to tune the car. It makes the car more responsive and more power hence you can save on petrol heavy footer may get about 13.5-14 km per litres. Adding strut bars to stabilize the car for corning is a good to have but not necessary unless u are always making a corner at 120km/hr. I love this car. Big Boot. Lots of accessories, added a roof rack for my bicycles and it looks awesome. I sound proof the doors and the roof. I would recommend the roof first if you have only 1 option. aircon panel on passenger side. the long panel. dont just quite look nice.. but thats just me. Went to Car House at Turf City to look for a Toyota Axio back in mid 2015. Despite not having a test drive, we were impressed by the functionality of the car. We were hesitant to spend more than the cost of the Axio, but when my wife agreed to spend a little more on the Honda Vezel, I jumped on it. Fast forward to delivery of the car in Nov 2015 after what felt like an eternity... Wow! Wow! Wow! We realised it had some small frills as compared to the very basic Mit GLX that we had before. After driving into 2016, we started to see so many vezels on the roads in SG. I guess people here are really into value for money + style. Super satisfied with this purchase! Honda Earth Dreams Engine from Japan. My switch from a previous manual Japanese car. Totally a new sensation behind the wheel. Smooth acceleration and powerful for a eventful ride. Comfortable seat and leg room. Great hanbling and curbing a bend. Get to cruise speed quite promptly. I am doing about 15.5km/l from the average of about 7 days for work and casual. Great dashboard display and very informative. Dashing and great feel on the road. Good view of the front and side. Big side mirror give clear view of blindspot and side views. Engine noise is slightly heard. Rear view mirror is small and view behind is small. Boot space is very open and item in the boot are not able to conceal. Small 40 litre fuel tank. This great small crossover with exceptional specification and attractive features will definitely attract the attention of buyers. It is designed to be a small family car (Do not expect a 7 seater), transporting five passenger and be very comfortable. For a BnB car, it is pretty average, suspension setup is abit hard, harder than my previous Subaru impreza which is quite stiff for daily usage. However insulation is pretty decent. Tried both petrol and hybrid, the latter is quieter. Size wise is pretty good for this segment, 3 adults are able to sit at the back comfortably with ample legroom and headroom, no center hump too. Looks great! Handsome front and back ends. Coupe style silhouette with hidden back door handles. Bright and functional LED headlights and LED backlights (hybrid). Looks great too! Front passengers are cocooned inside a comfortable space within the car, partly due to the high center console, allowing you to place your barangs barangs there. Lots of storage areas. Honda Sensing is a must! Adaptive cruise control, lane departure assistance and automatic braking to avoid collision. You can totally set your car on cruise control and your car will automatically keep its speed and distance with the front car. It will also keep you inside your own lane and brake for you when needed. There is brake hold too, useful for traffic jams where the car presses the brake for you when you stop, so that you can relax your right feet. Lots of airbags (8 for petrol and 6 for hybrid). There is also sports mode and econ mode to suit different driving styles. Reason why I choose hybrid over petrol after testing both for 15 minutes each. Petrol has ample of performance for a basic BnB car but the hybrid has 150+ bhp, similar to a 2.0l engine. Pickup for petrol and hybrid is around 11 seconds and 8.5 seconds respectively. This is probably the most value for money car in the market right now. For the price of a mid sedan you get plenty of features, such as GPS, reverse camera, cruise control, brake hold, auto brake, economy mode, sports mode etc. In terms of cost of driving it's very attractive too, the car is very fuel efficient but yet powerful. Road tax is low because of the small engine. But you get the joy of driving a spacious car that's almost like an SUV. I only gave 4 for reliability because of the short battery lifespan when it first came. As for handling, it's quite annoying to have to switch off the auto brake system and auto engine shut down when you step on the brakes every single time you start the car. The GPS may also go crazy sometimes in bad weather, but most of the time reliable. - Brake hold. Car never slides backwards in ramps. - Need to switch off auto brake everytime when starting engine or else it will give you a violent and annoying sudden break of the car when passing through carpark barrier. Compared to my previous basic Japanese sedan, this Vezel is such an upgrade in terms of features and conveniences. I no longer have the urge to travel from point to point in a rush, as if to get out of the car asap. The drive is leisurely done and the enjoyment in driving is once again rekindled. I was considering the Sienta before this. I am glad I have made the right choice. Compared to Sienta, the specifications of the Vezel is much higher esp the engine and also the features. Buying accessories for the car is also so much a breeze. Just ask Caurosell. My second SUV, Like this car as its comfortable for city driving and handling is good. Light wight & compact size make it easy to menuvar and easy to park. Decent SUV price and it's exterior look is super cool. Just got my Vezel. Enjoying the ride, easy and very comfortable. Spacious in the boot, plenty of headroom and arm room for 2 front seats. Good looking on the outside and inside for this price range. The features of CBTA, Brake hold , cruise control makes driving a breeze. Added good experience with purchase as I got a good PI, made it a short and smooth process. -Added features of CBTA, Brake hold , cruise control makes driving a breeze. -Compartment space is lesser than that my old car eg, card or coins compartment , side door compartment can be more spacious to accommodate car park coupons, small hidden hook at back of seat to hook jacket or things. Just received this car on the 29th Jul 2016. Smooth and fuel efficient ride. Cruising on the expressway is fast and smooth. If you like power, feel free to try out the non eco mode. Exterior design, interior design. Easy to decorate and poison haha. Slightly bigger car than typical saloon cars. You need a bit of time to get used to the new car's handling. Been driving the Vezel for about 8mths and still enjoying the driving experience till today. 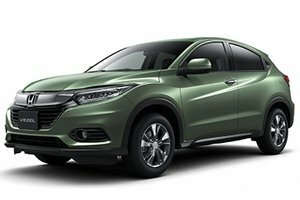 I was contemplating on getting the HR-V from KM vc PI. But after comparing the specs of HR-V & Vezel, the choice was quite clear. Definitely no regrets in getting the Vezel. Good handling, well designed , powerful car despite its big body size . Up market exterior & spacious interior and also adequate booth space. For the CAT A catalog , its is a powerful car at 155NM / 96KW/ 129bhp and still good fuel efficiency. City brake assist system ( Safety feature to prevent collision at low speed). Huge side mirrors ( provide good clear vision when filtering lane). 16" Rim standard . Should give at least 17" Rim as standard. Front passenger seat cannot be adjusted higher ,only driver's side could. Car should be higher, current its 1605mm Ht , better if it is at least 1615 Ht for better head room space , height and more ground clearance. Overall its is a good car. This car is too common and too many on the road especially white. Overall a normal car as Honda has no more cars that are worth to buy. Cheap looking trip meter and controls with no navigation menu. Hidden console underneath gear knob. Auto window only for driver side. This is my 2nd Jap. I previously owned a french turbo. While performance was really excellent for the price, I had alot of inconveniences. Parts break down quicker. Anyway, it's history and it's back to a Jap. I was looking for a simple car, the lesser electronics the better. The Vezel is simple as compared to my previous car. Being NA, it is responsive and the Power over Weight ratio makes the car torquey despite it being a 1.5L car. Turning around the bends at Neo Tiew was surprisingly better than I'd expected. The car on stock is a very decent ride. It's a Crossover with CVT so manage your expectations and this car will serve its purpose well. Authorised Distributor Honda cars are Honda City Reviews, Honda Civic Reviews, Honda Civic Type-R Reviews, Honda CR-V Reviews, Honda HR-V Reviews, Honda Jazz Reviews, Honda NSX Hybrid Reviews, Honda Odyssey Reviews. Parallel Imported Honda cars are Honda Civic Hatchback Reviews, Honda Civic Type-R Reviews, Honda Fit Reviews, Honda Fit Hybrid Reviews, Honda Fit Hybrid Speedo Motoring Edition Reviews, Honda Fit Speedo Motoring Edition Reviews, Honda Fit Trust Motoring Edition Reviews, Honda Freed Reviews, Honda Freed Hybrid Reviews, Honda Freed Hybrid Trust Motoring Edition Reviews, Honda Grace Hybrid Reviews, Honda Odyssey Reviews, Honda Odyssey Hybrid Reviews, Honda Shuttle Reviews, Honda Shuttle Hybrid Reviews, Honda Shuttle Hybrid Speedo Motoring Edition Reviews, Honda Shuttle Trust Motoring Edition Reviews, Honda Stepwagon Reviews, Honda Stepwagon Hybrid Reviews, Honda Vezel Reviews, Honda Vezel Hybrid Reviews. sgCarMart is the number one car site for buying Singapore cars, including new cars, parallel import cars, Toyota, Honda, Nissan, Volkswagen, Mitsubishi & BMW. We have new car dealers comprising parallel importers, authorised car distributors, and used car dealers who have the New Honda Vezel Trust Motoring Edition latest price Find new car pricelists, new car launches, new car promotions, new car reviews, latest car news & car articles. Read the New.Honda Vezel Trust Motoring Edition consumer reviews to help you decide on buying a car. Also join our car discussion and forum discussion for car reviews, motoring news & motoring guides. Visit our partner sites who have job openings for Singapore jobs, Singapore classifieds, mover and real estate properties for sale.